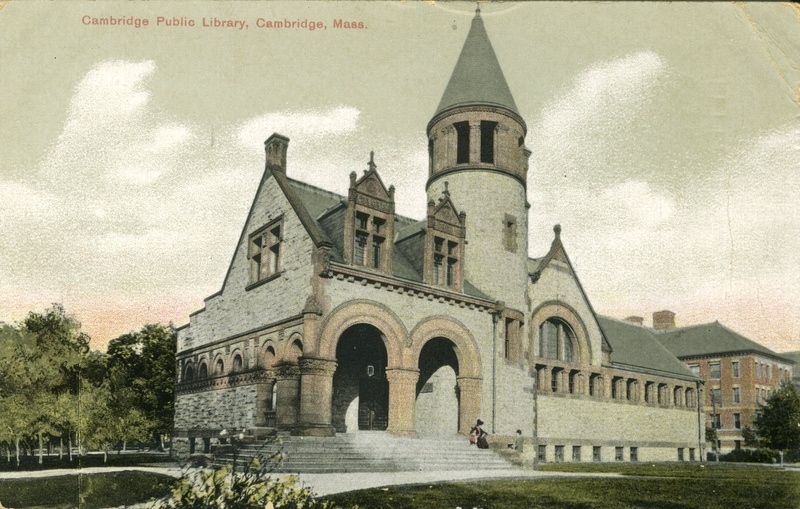 Historic tidbits, facts, and notes of interest on Cambridge, Massachusetts brought to you by the Cambridge Public Library's Archivist. Muralist Elizabeth Tracy painting the “Development of the Printing Press,” courtesy of the Cambridge Historical Commission, Cambridge Photo Morgue Collection. To follow up on our post about muralist Elizabeth Tracy, our friends at the fantastic Cambridge Historical Commission sent us a photograph of Tracy in action with fellow muralist, Arthur Willis Oakman. Tracy and Oakman are painting “the Development of the Printing Press,” on the west wall of the Library’s Reading Room. This mural follows the evolution of the printing press from Guttenberg in 1449 through the invention of the cylindrical press by Hoe and Co. in 1820. At the center is the 1639 Stephen Daye press of Cambridge, the first press in America. The photograph, along with a large collection of the Cambridge Historical Commission’s photographs, can be found on the Digital Commonwealth website. Photograph of a Painting of Washington Taking Command of the American Army at Cambridge, Massachusetts, from NARA: http://research.archives.gov/description/532915. Today, the Digital Public Library of America (DPLA) launched. So what’s that mean? The DPLA is a project aimed at bringing about a large-scale public digital library, free to anyone with an internet access. It aims to unify several digital collections like the Library of Congress, the Internet Archive, NARA, and academic institutions, and public libraries. The Cambridge Public Library’s Archives and Special Collection’s materials will be added to the DPLA through its partnership with the Boston Public Library, Digital Commonwealth, and the Internet Archive. Stay tuned for more. In the meantime, check out these search results on Cambridge, Mass.